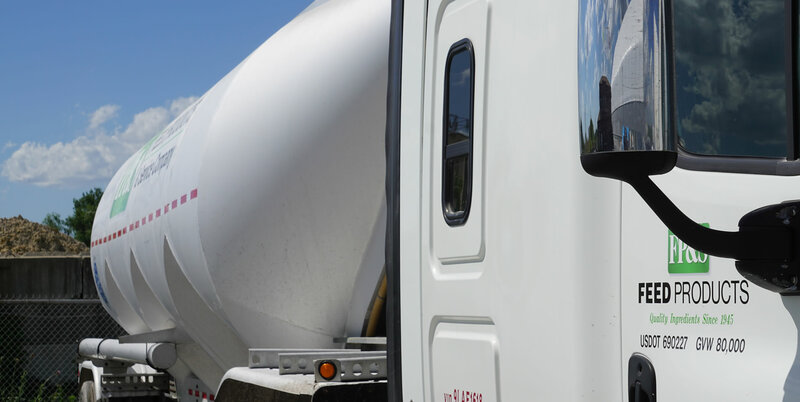 Customers can depend on Feed Products for reliable on-time delivery because we control distribution from the time the product is sourced until the order is completed. Our infrastructure stretches from ocean shipping arrangements to rivers, roads and rail systems in the United States. With this reach we seek out the most cost-effective shipping routes and pass those savings along to customers in the form of competitive pricing. When customers’ timetables call for accelerated delivery or special shipping instructions, we are able to accommodate those needs because we have strong and long-standing relationships with freight companies. Strategically placed warehouses and significant investments in material handling and packaging capabilities add to the effectiveness of our distribution system. The individual properties of minerals and nutrients blended into feed products require different handling processes. Feed Products has the tools to match those properties. From automated movers to a full complement of meshes and screens, we ensure that customers’ quality and consistency requirements are met. The result is an efficient material handling system that enhances our ability to deliver high-quality ingredients that meet specifications for nutrition and physical properties. It also gives customers the flexibility to order products in the quantities and packaging that best fit their facilities and needs, from bulk to bags. Our transloading facilities can empty a rail car in less than 15 minutes. That means tons of minerals or feed nutrients will be transferred to trucks in less time than it takes the first truck filled to travel 15 miles at highway speed. That kind of efficiency comes from state-of-the-art equipment in a facility big enough to handle 50 rail cars at a time. Feed Products has transload contracts with facilities in Texas and western Kansas. Increasingly we are finding opportunities to apply our logistical knowledge and industry-leading equipment to meet the needs of customers outside the animal feed industry. Customers seek out our detailed logistical experience to help them solve other transportation situations. When customers outsource commercial transloading requirements through Feed Products, they know that the process will be handled with the same standards that apply to our own shipping arrangements. Strategically placed warehouses and significant investments in material handling and packaging capabilities add to the effectiveness of our distribution system. Feed Products owns 500,000 square feet of warehouse space in addition to storage at other strategic locations around North America. Our warehouses play a key role in customer service. Deliberate placement underscores our commitment to be able to meet customers’ quality and delivery specifications. The ample space and professional management of our warehouse system has made Feed Products a valued partner for both customers and suppliers. Within our warehouse system are facilities that can accept container-size shipments and break them into amounts to match customer orders, whether they want bulk shipments or bags. Suppliers store products with us because they trust us to maintain ingredient quality and provide easy access when they need their material. They also have the assurance of certified food safety. Feed Products can accommodate customers' requests for orders in various amounts and configurations, from bagged product to bulk deliveries via truckload or rail. Feed Products’s state-of-the-art equipment accommodates those custom orders. Our worldwide sourcing, versatile blending capabilities, and diverse packaging options also allow customers to order products for private-label offerings. © Copyright 2018 Feed Products & Service Company | All rights reserved.